Woweee, was that a tough decision. Each person who entered (11 in all) had something beautiful to offer, and I say that in truth, with affection. One of my students even entered, which was kind of touching, as many of them don’t really care about the blog. The reason I chose this particular entry is because I felt like I learned something about my approach from it. I have also taken the liberty of sharing the runner-up’s entry, which could have easily been the winner as well. In fact, I’m going to ask Strings if they’ll give him a subscription, too. Honorable mention to GGP, for pithiness and charm. Without further ado, the winner is: Autumn Hiscock!! The essence of Emily’s take on teaching through her blog boils down to relax (both your body and your expectations: beating yourself up helps no one); respect (yourself, your instrument, and those you work with); trust (your choices, your teachers, your musicality); honesty (lying to yourself sabotages your progress and development); challenge (your habits, your comfort zone, and your routine to find inspiration); simplify and clarify (your approach, your patterns, and your goals); distill (complicated instruction or an overload of technique to sift the wheat from the chaff); and listen (to your heart, to those who genuinely seek to help you grow, and to the music inside you and on the page). Emily encourages us to think about our playing holistically instead of just focusing on how to produce sound. I find this invaluable because so many articles talk about mechanics without acknowledging that there’s a human being trying to produce the music. The issues she addresses always have some application or connection to my needs, which suggests that they’re universal without being vague. She delivers technical explanations clearly and with humor. Emily never loses me. She’s clear, direct, and couches her advice in terms I can easily understand and apply to my own experience. Fantastico! I left the flattering bit in there, because I want other teachers to know how important demeanor is in the learning environment. 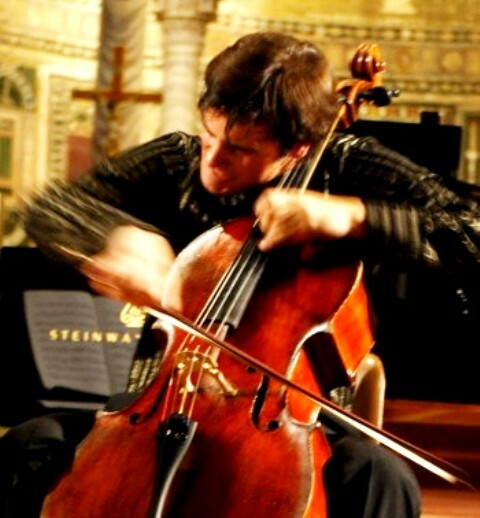 The cello is tough enough without being abraded in the lessons. Teach as you would want to be taught. technique, and if you happen to get a good sound, that’s a bonus! open if necessary. Breathe audibly or even hum if necessary. ears. Stretch before and after practice to avoid injury. is difficult, isolate one aspect of your technique at a time. doing — it may be your bow! better, 500 times is best. Chop wood, carry water! As a side note, I am going to be blog-lite for this week and some of next. My left arm is starting to threaten tendinitis (oh how I wish it was spelled tendonitis) and I have to take it very seriously to avoid major downtime. I can still type with my right hand, though, so I’ll try to get back to the commenters and emailers. I’m printing out Justin’s summary to pin above my music stand. It’s great. Congrats!! Both are beautifully written. These are indeed terrifically written. Actually, I think I should come back to them and review them once in awhile. I know, I’ll print them off and put them in my current practice rep binder.